Remember earlier this week, when I showed you the awesome Lego bracelet that I ordered online? Of course you do, because you've all been begging me to tell you where I got it! The Lego Fun Bracelet came from the Etsy Shop Michelle's Charm World. And Michelle is giving each of you a chance to win one of these sweet and funky little Lego Heart Necklaces, shown above, in the color of your choice. 1. Leave me a comment with your email or blog address and name your favorite item in Michelle's Etsy shop. 2. Leave a comment with your favorite 4th of July/Summer recipe or craft idea. I will announce the winner on Tuesday. Good luck. Thanks for reading. And have a great weekend! What a cute necklace and a great Etsy shop. So many to choose from and trying to narrow it down to one favorite item is a bit challenging...so I will say my top 3 picks are: Lime Love Chunky Bracelet, Long Lego Necklace and Chocolate Candy Bracelet. 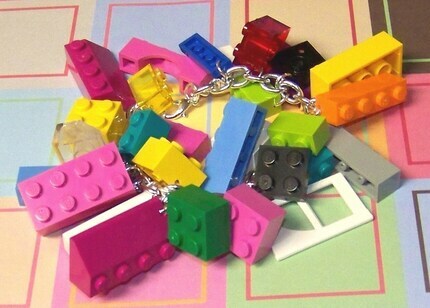 Besides the bracelet you bought, I like the Lego of my Colorful Bracelet. My favorite recipe is a flag cake with strawberries, blueberries and whip cream...Delish!! I LOVE the Lego heart. What a great idea. I make jewelry and that is too interesting. I really like the Alice in Wonderland Mad Party Tea bracelet. The fourth of July is my FIL's birthday, so we usually spend the day with them. The last couple years I've made him a flourless chocolate cake with raspberries (he's gluten intolerant). I love the strawberry lemonade bracelet! Every 4th of July we have corn, LOTS of watermelon and a burger...YUMM! you know my email address......but I need to win. I gotta win. I am a weiner! My favorite at this moment is the 'shy' necklace. Not because i'm shy, cuz we all know I'm not, but because I'm a Scrabble fan. This has become a favorite of mine. altho it's not Red, White, Blue...there are strawberries for the red, dressing and cheese for the white, and I see no reason why you couldn't use blueberries. 1 Mix all 4 up and pour over your salad and mix (use spinach, some romain lettuce, green onions, sliced almonds, strawberries, feta or goat cheese, cucumbers). 2 Do a little at a time because you won't need all the dressing you made. and I already follow you. I am like Kendra, I love a jello flag cake with jello and strawberries and blueberries and whipped cream and berries on top! It is one of my favorite desserts and brings back lots of childhood memories! LOVE IT!! I am definitely a follower . 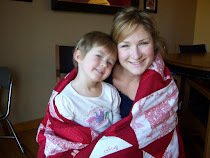 . .
My favorite 4th of July craft idea - which we will be doing this year. Is a flag banner with pictures of things we appreciate about our community and our country. I love the tiny dot lego earrings. So stinking cute! I recently made a cute windchime for cub scouts. It had nesting tin cans wrapped in red/white gingham paper with a dangly canning ring underneath. I tied strips of red/white/blue fabric to the ring. Very cute and 4th of July. And I followed. I already had you on my google reader blog list thing. But it's not official. Thanks so much. This is a fun blog to read. I love the chunk pink candy necklace.